The worst of the worst, all in one place! 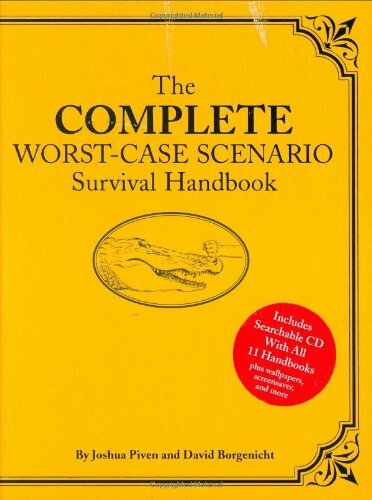 This deluxe desk reference includes a hardbound volume of the most popular scenarios from all 11 Worst-Case Scenario handbooks, plus the entire contents of all the books on a fully searchable CD. Avoid the perils of mountain lions and blind dates, avalanches and teenage driving lessons, runaway golf carts and Christmas turkeys on firea remedy for every crisis the worst-case experts have anticipated is now only a click away. The CD also contains newly created extra features: screensavers, e-cards, wallpaper, and more. Boasting more than 500pages, this sturdy addition to the Worst-Case Scenario library could stop a bulletjust one more way to be prepared for the worst.